President Momis also defended that the current government has practiced good governance under his leadership and has done more than the previous government. One of the achievements of the government was the change of public service act. President Chief Dr John Momis questioned the ex combatants, how many weapons have already been disposed and why people were still using weapons? Photo Caption: New Chief Secretary Monovi Amani greets a leader of ex combatant Ishmael Toroama after the forum. The forum ended with a shaking of hands between the ABG Ministers, senior public servants and the leaders of the ex combatants as seen in this picture by Tanya Lahies. On Friday, 30th of January 2015, a group of ex combatants from the South and Central Region, confronted the Autonomous Bougainville Government President Chief Dr John Momis with questions on issues, that received a lot of attention on the Social Media last year and early this year. The confrontation was an attempt to get answers, by the ex combatants to the ABG Government. Prior to the forum, a petition was presented to the President asking him to resign based on the grievances’ raised and that he should do so if the accusations or questions were not properly answered. The forum was to get clarifications about information of the latest development brought in by the current government. Leaders of the ex combatants Ishmael Toroama with Thomas Tari and Sam Kauona presented their grievances based on what they saw as outstanding issues which was not properly aired out. Ishmael firstly explained that it was unfortunate that such an outcome had lead to a public forum but the reason for their public appearance was to get answers from the Autonomous Bougainville Government. He emphasized on the Bougainville Peace Agreement, how they have completed their part and how the government needs to complete theirs. He emphasized on good governance and questioned how well the government has shown leadership at the administrative and political level. Ishmael also acknowledged the United Nations Development Program for the part they played in ensuring the weapons disposal process was completed. • Why four members of the government owned shares in the Poge Investment? • Bridges need to be built in the North West?? Who is responsible? Where is the money going? Thomas Tari also a leader of the ex combatants presented his views about patriotism towards holding a referendum. He spoke on how the government has failed and that there were still outstanding issues and asked for the government to explain clearly so that they are at ease. • The MV Chebu was a joint share between ABG and Henry Chou the owner of HAKAU Investment. This means the ABG held a trustee share of which the share belongs to the people of Bougainville. He reassured that it wasn’t a personal share. BUT that the ABG looked after the money that legally belongs to the people of Bougainville. • Bougainville POGE Development Corporation comes under the Bougainville Government and that four members hold a trustee share in the corporation and that- it didn’t mean any of the members have personal control or ownership of the share but the shares belong to the people of Bougainville. • The Torokina Oil Palm project was implemented by the Kabui Government. Since the implementation of the project, there has been a lot of misuse of funds. During the current government, the project was advertised and three companies applied and Hakau Investment won the bid to develop the project to providing technical services and successfully completed the work. The project is not a failed project. It is an ongoing project. • Referendum- the talk to defer referendum is not true. Referendum will happen when two Governments (ABG and PNG) sit down and look at all the criteria of the Bougainville Peace Agreement. Referendum will look at good governance and weapons disposal. President Momis urged that the people and Government have no power to defer referendum. By, 2020, the referendum should be held. The president also clarified that the statement he made that a referendum will be held in 2019 was not a final decision but a thought based on how he sees the current preparation of the people and what the outcome may occur, looking at the political level nationally and internationally but he urged that it isn’t deferred. He explained that if the people were ready to hold a referendum, it could be held this year, but then, the people must be ready to except the outcome. He advised that the result of the referendum would be measured by the United Nations and the National Government using the Bougainville Peace Agreement as criteria. President Momis also defended that the current government has practiced good governance under his leadership and has done more than the previous government. One of the achievements of the government was the change of public service act, he added. Momis questioned whether the petition for him to resign had criteria that could be used to judge him and be leveled against the developmental goals and achievements of his government. President Momis reiterated that it was the people who gave him the mandate to become the president. Note: The second part of the forum will be posted tomorrow evening. 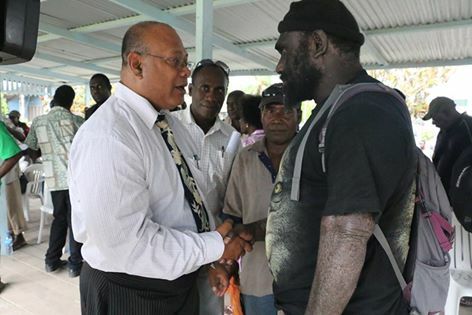 Mycall Essam Miise posted on Facebook: It is good news that the ABG has met with the Ex Combatants and other Bougainvilleans to discuss and understand each other so that Bougainville continues to progress. It is very important for dialogue or communication with the government and Bougainvilleans to continue. Now people should continue with their daily lives. The issues raised by the Ex Combatants are issues that were widely discussed to the point where people accessed each other. Momis has responded, as per this report, to these issues. He has given us information regarding those issues (Torokina oil palm, POGE, Chebu and Referendum). 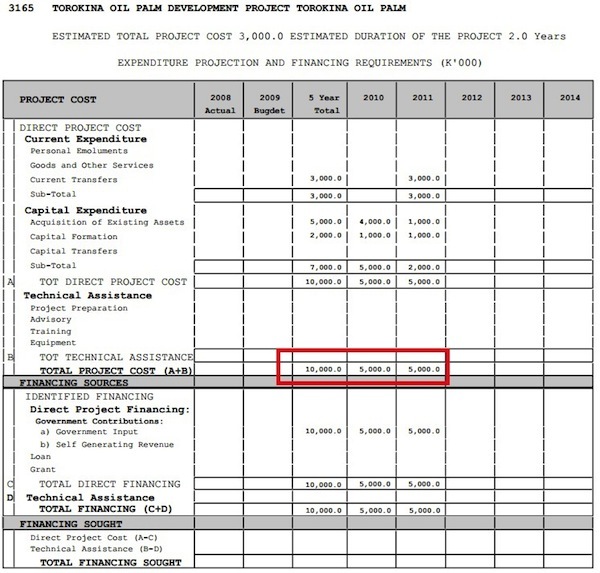 From this brief report there was no mention about the allegations in the Torokina project. One question that is still begging answers is the amount of money K1M that was allegedly paid to Hakau. There were talks that an investigation was instituted to look into this but as of today I don’t know whether there is a report or not? May be the second part of this report will give us more details? Thanks for the meeting. This is a way forward because we don’t have a opposition government for good reason as they might play too much politics and forget the people. Nigel Bereka Ex combatants (esp so called Commanders) will always be a thorn on the side of the ABG..The ABG should pass amendments and do away with anythin related to the ex coms in the govt..Abolish the three ex com seats( North,Central and South) and the Ministry of Veteran Affairs..These bodies have gone past their use by date..Their incorporation in the current govt structure/set up makes them think that they own the ABG..
Chris Baria If people don’t understand then whose responsibility is it to inform them or educated them if you like. We can’t blame people for being uneducated but they have the right to know what their government is doing. No one is right all the time we are all humans and the government is prone to human errors as well. Raymond Mark Minaka Chris i referred to the ex-coms. not the people.Cheers! Fidelis Golu Ray, I guess the excoms are people to. Everyone has the right to know the government processes for transparency purposes and to hold the govt accountable for any failure in service delivery. Simple processes and procedures can be made public for general consumption but others cannot be published and should be kept in confidence by the govt. Chris Baria Thank you Fidelis….. excomb is a label like any other on the supermarket self. If we cannot hold our government accountable for its actions, especially a government that lacks a credible opposition then it will soon be the law unto itself. Chris Baria A good leader is the one who prefers people to challenge him. Tony Kiata Nigel, you hit it on the exact dot now. Who is this three elected excom members represented in the Parliament? Nigel Bereka Raymond Mark Minaka I agree..Thats what I heard from most of the people who were audiences during the forum..And they also went to the extent of stooping so low to ask the president to resign..
Chris Baria There are times when drastic action is required especially to clear up the air and when there’s a probability everyone in the HOR have jumped the band wagon with no credible in-house opposition bench. The President is not a monarch nor is he a diety but a servant of the people, whether they be ex-combatants or otherwise. In 1989 he stooped low to agitate Panguna Landowners when he led a protest to BCL office at the mine site. He played on the ignorance of a simple minded village folk when really he should have been fighting in the Parliament not playing on the gutter. The BCA was many terms overdue and where was he all that time. So ask him about what happened to the right channel back then that now we here trying to put all the pieces back together. Fidelis Golu All the best to all those who will be standing up this coming election. May the best person win the election including the Presidential seat. The people of bougainville will depend on you to bring us forward towards referendum and possibly towards independence. God bless Bougainville!